The reintegration of members of the Basque militant separatist group ETA – recently released from prison – remains a challenge for a society that has suffered from decades of bloodshed. ETA announced a “definitive cessation of its armed activity” on October 20, 2011 – although negotiations on its disarmament continue. In the Basque region’s biggest city, Bilbao, they are given help to readjust to life outside prison by the association Harrera Elkartea -with paperwork, health matters, employment efforts and finding their feet financially. The former convicts often shun the media. The ex-inmates re-enter society knowing that many people consider them beyond contempt. Rubén Múgica is with a collective that defends the rights of ETA murder victims, such as his father. “What is impossible is coexistence between normal people and the criminals. If the criminals deserve all the attention for having given up killing, I say more those who have never killed are worth more attention,” Múgica continued. José Ramón Goñi Tirapu was prefect of the distrtict of Guipuzkoa in the Basque Country between 1987 and 1990. ETA tried to kill him several times. Years later, José found out that his son was a member of the organisation. He told his story in the book, “My son belonged to ETA”. Euronews’ Filipa Soares spoke to him about his experiences. Filipa Soares, euronews: Could you describe what you felt when you discovered that your son belonged to ETA? José Ramón Goñi Tirapu: Firstly, you feel a need to help a son, who is in a dramatic and difficult situation. Almost simultaneously, you think that this organisation kills people – even if he himself hasn’t done that. That organisation tried to kill me in several occasions. This creates a great conflict for me. In the first moments, I didn’t know how to react. I felt like I was out of this world. I couldn’t comprehend it. It’s impossible to understand how a son you raised – you’ve lived with him, you’ve loved him and you still feel love for him – is in a situation so distant from yours… one that is so cruel to you. euronews: Your son has evaded justice. In your book, you say that he lives in France and that you haven’t seen him for 20 years. Why can’t you see him? José Ramón Goñi Tirapu: He lives in a world that I can’t enter. He’s living in a different world and the doors are closed. There’s no possible communication. If I was to see him, his world would not forgive him. It’s a mafia – and for a part of my life, while I was a prefect, I was in the other extreme. I represented the Mafia’s enemy – the enemy of everything that represented. Therefore, he could also have problems. I think about that too. But mainly is the distance between us. He’s in a world that he’s not allowed to leave. It’s not that they do it extensively or publicly, but the situation of fear between them is very relevant. We can’t forget that ETA has killed some of its own militants, important ones, because it considered them traitors. euronews: But do you speak to him? José Ramón Goñi Tirapu: No! No! I don’t speak to him. I haven’t had any communication with him for more than 20 years. euronews: Do you think you’ll see him soon? José Ramón Goñi Tirapu: I think I will see him soon. The situation is going to be very difficult surely, but I’ll see him soon. euronews: It could be the first time in 20 years that your son sees you. What would you like to tell him? José Ramón Goñi Tirapu: That it’s over. ETA is over. The organisation itself says that. ETA is over! It’s over! It doesn’t have any sense. If he has a political idea, he should pursue it publicly, but in another way. Not by using coercion over the population. It’s difficult to speak directly with my son. 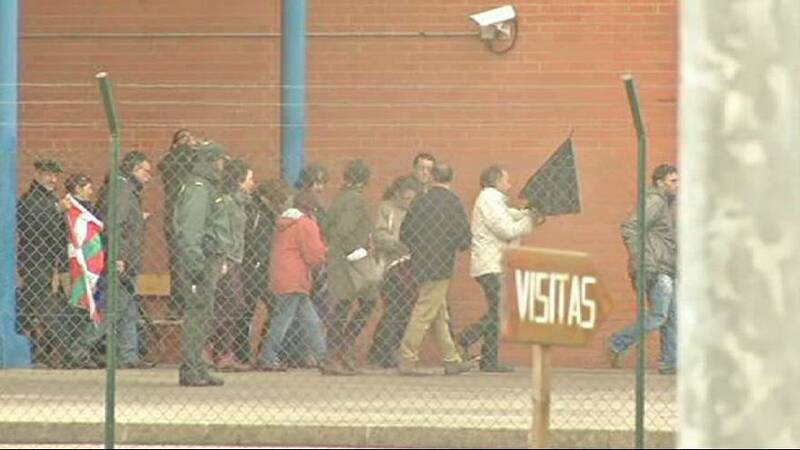 What now for ETA's prisoners?